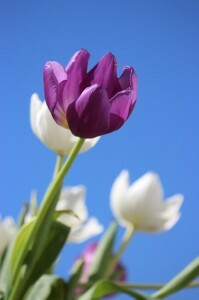 Part 1 : Getting your property ready for Spring! This winter has been one of the worst winters I can remember in the Kansas City area as well as other parts of the country. It seems to be a never ending but I am convinced that spring is just around the corner! So to help you and your property gracefully come out of hibernation, this will be a 3 part blog series in the coming weeks to help you transition easily into spring. It will help you to stay ahead of any problems that could have been secretly brewing in and around your property during the winter months. Today will cover the things you can observe and pay close attention to on the exterior of your house. Let’s start from the top. The roof gets hit with the brunt of the bad weather. Simply get a pair of good binoculars, we don’t recommend climbing up there yourself, and just observe the condition of your roof. Are any shingles missing, cracked, or curled up? If you have a chimney you will need to check for signs of damage/normal wear and tear. Just like shingles on the roof, any hole or crack in the exterior of your chimney can give water space to go and cause serious damage. It is very important to make sure gutters are in peak condition going into a rainy spring season. Observe if there are any holes, cracks, or rust along the pipes and that they are well secured. Make sure that the downspouts are securely fastened to the house. One of the most important things to do is make sure that all gutters have a good splash block so the run-off water is directed away from the foundation of the house. Let’s be honest here, the exterior walls and the foundation are what keeps your house strong and standing, therefore giving extra attention to these parts of your property is of utmost importance. Look for any holes, cracks, or water damage in the walls. Check that there aren’t any places for wildlife or insects to get in and make a home (the woodpeckers will soon be pecking away at many houses creating holes for all the other creatures to enter). Foundation cracks should be handled by a professional and not just repaired with a temporary caulking job. The condition of your property’s windows can be the difference of hundreds of dollars on your heating/cooling bill. You want to be sure that no air is escaping out or coming in through the window. You can prevent this from happening by making sure the caulking and weather stripping are in good condition around the perimeter of the window. By using these simple but effective tips, you can be sure your property is ready for the warm and wet spring months ahead. Stay tuned for the next blog post that will cover what to check for in the interior of your home! Daylight Savings is November 3rd and Also a Good Time to Check the Smoke Detectors! You are urged to change more than your clocks when Daylight Savings Time ends on Sunday, November 3rd. It is also time to test your smoke detectors and change the batteries if necessary. A properly installed and tested home fire alarm with a fresh battery is one of the simplest and most effective things you can do to protect yourself and your family from a home fire. Batteries are about $7 and this potentially life-saving move should be done twice a year – at the beginning and end of daylight saving time. It’s a small price for your family’s safety. Tragically, many people mistakenly believe they’d be awakened by the smell of smoke in time to escape. Clinical experiments have found that the sense of smell actually lessens when people are asleep. In addition, smoke disorients people and dulls their senses, making it less likely that other cues, such as cries for help, will awaken them. This is why working smoke alarms are so important. Although smoke detectors are present in 94 % of American homes, 20% do not work, mostly because of dead or missing batteries. That means roughly 19 million homes are at risk due to non-working smoke alarms and another 6 million homes are at risk due to no smoke alarms. In the U.S. roughly 80% of fire deaths result from fires in homes without working smoke detectors. Half of the home fire deaths resulted from fires in the small percentage of homes (6%) without any smoke detectors. If a fire occurs, working smoke detectors cut the risk of dying in a home fire nearly in half by providing early warning and critical extra seconds to escape. Eighty-three (83) percent of all civilian fire-related deaths are a result of home fires. The National Fire Alarm Code recommends a minimum of one smoke alarm on each level of a home, including one inside each bedroom for new construction and one outside each sleeping area. In addition to changing smoke alarm batteries, smoke detectors should be replaced every ten (10) years. Somewhere in the nation, a home fire death occurs approximately every three hours. The peak time for home fire fatalities is between 10 pm and 6 am –When most people are sleeping. 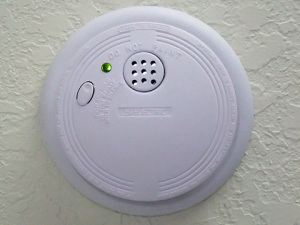 Households with non-working smoke detectors now outnumber those with no smoke alarms. 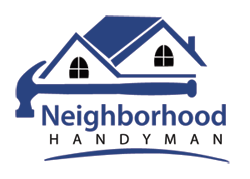 Neighborhood Handyman Has a New Logo! Another interesting aspect of the logo contest is that we were able to send out a contest link to friends, families, vendors, etc. so they could vote on the logos that they liked the best! We ended up leaning towards the logos that had the most votes with highest ratings.